The first live-action spin-off from the long-running anime series did so well that this sequel immediately followed. But while I love the characters and the stories, the live-action films are disappointing. Even though my expectations were pretty low for this sequel, as an adult, I was barely entertained. 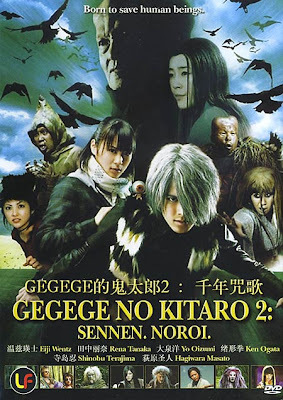 My main consolation is that least these films are raising awareness about Gegege No Kitaro, and the character has finally made a debut on English subtitled DVDs. I can't get enough of Kitaro's many anime series. They first appeared on Japanese TV in 1968. But to do Shigeru Mizuki's stories justice in a live-action movie requires a considerable budget, which this sequel lacks. I got the same vibe off Saiyuki: Monkey Magic, made in Japan the same year. It's good fun for kids, but lacking the intrigue and sophisticated special effects to please adult audiences. The Millennium Curse begins with a typical scare as young women are menaced by ancient spirits. During the title sequence we get a flashback of Kitaro's origin (also seen in the impressive anime OVA Hakaba Kitaro) as baby Kitaro crawls out of his mother's grave, guided by all that's left of his dad (the walking eyeball). 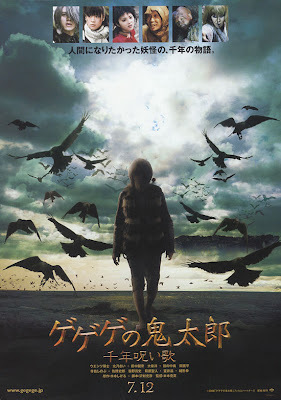 Kitaro, Rat Man, Cat Girl and the gang now have to unravel the mystery of a series of disappearances, all linked to an ancient curse lingering after a great injustice, many centuries ago. While the plot is solid, it generates little intrigue or excitement, even in fight scenes. Kitaro's primary weapons are his flying wooden sandals and needle hair - these are made to look dynamic and interesting in the anime but fall flat when rendered realistically. On the upside there's the late Ken Ogata (The Hidden Blade, Mishima), in his final film role as Kitaro's nemesis Nurarihyon. But this arch-villain doesn't fully emerge until the climax. The finale is especially impressive for a well-animated giant skeleton piling on the jeopardy. 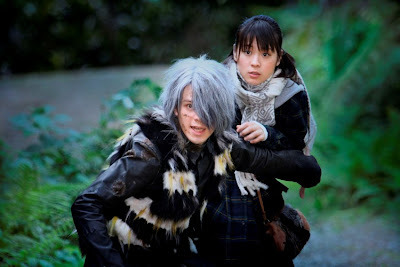 But mostly the yokai monster make-ups of supporting characters are either obviously CGI or use completely static masks. Two busy monster scenes in the yokai library and the forest simply look like a bunch of dancers in masks. I'd rather yokai monsters be done properly or not at all. The effects in these scenes reminded me of similar techniques used in the 1960s yokai film trilogy. For instance, there's nothing on the scale of the flying demon attack on Kitaro's house in the first film. The main cast are good, all returning from the first film. Once again Yo Oizumi makes the most of the treacherous, hypocritical, smelly Rat Man. The baddies include Yasha, who's a terrifying yokai in the anime who hypnotises victims with his music and steals their souls. But here the character looks like a failed rock star who only uses his guitar like a machine-gun rather than for anything supernatural. I might have enjoyed the story less because of the poor English subtitles on this Malay DVD, available here from HKFlix. But really, the 2007 anime series would provide more action and scares than this - that's what I'd prefer to see on DVD. 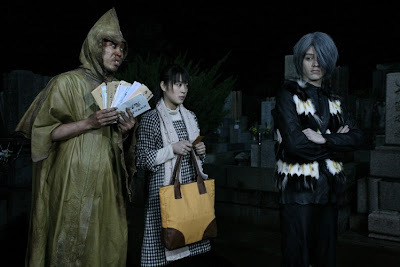 My review of the first Gegege No Kitaro film is here. My guide to the Gegege No Kitaro anime series is here. ... and there's an English subtitled trailer on this page in the AsianMediaWiki. Much more background info, pictures and a plot summary on SciFi Japan, and Sarudama.